Citation: Cao, W., Williams, S., Flament, N., Zahirovic, S., Scotese, C., and Müller, R. D., 2018. Paleolatitudinal distribution of lithologic indicators of climate in a paleogeographic framework. Geological Magazine, 1-24. Abstract: Whether the latitudinal distribution of climate-sensitive lithologies is stable through greenhouse and icehouse regimes remains unclear. Previous studies suggest that the palaeolatitudinal distribution of palaeoclimate indicators, including coals, evaporites, reefs and carbonates, has remained broadly similar since the Permian period, leading to the conclusion that atmospheric and oceanic circulation control their distribution rather than the latitudinal temperature gradient. Here we revisit a global-scale compilation of lithologic indicators of climate, including coals, evaporites and glacial deposits, back to the Devonian period. We test the sensitivity of their latitudinal distributions to the uneven distribution of continental areas through time and to global tectonic models, correct the latitudinal distributions of lithologies for sampling- and continental area-bias, and use statistical methods to fit these distributions with probability density functions and estimate their high-density latitud- inal ranges with 50 % and 95 % confidence intervals. The results suggest that the palaeolatitudinal distributions of lithologies have changed through deep geological time, notably a pronounced poleward shift in the distribution of coals at the beginning of the Permian. The distribution of evaporites indicates a clearly bimodal distribution over the past ∼400 Ma, except for Early Devonian, Early Carboniferous, the earliest Permian and Middle and Late Jurassic times. We discuss how the patterns indicated by these lithologies change through time in response to plate motion, orography, evolution and greenhouse/icehouse conditions. 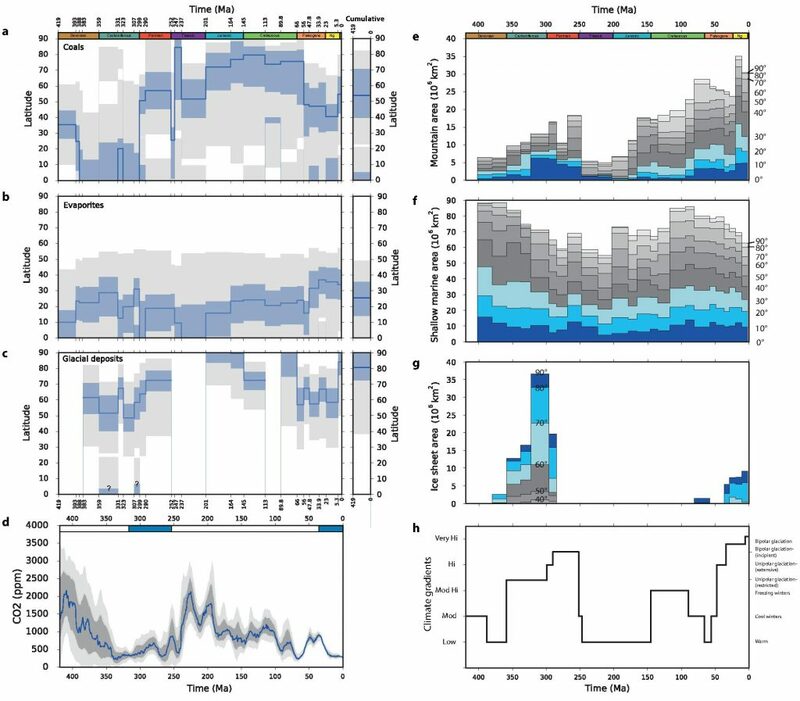 This study highlights that combining tectonic reconstructions with a comprehensive lithologic database and novel data analysis approaches provide insights into the nature and causes of shifting climatic zones through deep time. Figure. (a, b, c) High-density latitudinal belts of coals, evaporites and glacial deposits, with 50 % (blue area) and 95 % (light grey area) confidence intervals for each time interval since the Devonian period. The blue lines are the most significant peaks of latitudinal distribution. The areas with a question mark indicate records of limited use for climate interpretation. Cumulative high-density probabilities are presented on the rightmost side with bold borders. (d) Atmospheric CO2 concentration curve since the Devonian period, derived from Foster, Royer & Lunt (2017). 68 % and 95 % confidence intervals are shown as dark and light grey bands. The blue line represents a locally weighted scatterplot smoothing (LOESS) fit, a nonparametric regression fit from Cleveland & Devlin (1988), through the data. Icehouse intervals and greenhouse intervals (Hay, 2016) are indicated by a blue band and a white band, respectively, at the top of the panel. (e) Global palaeolatitudinal distribution of mountain ranges since the Devonian period calculated from the set of palaeogeographic maps (Golonka et al. 2006; Cao et al. 2017). (f) Global palaeolatitudinal distribution of shallow marine environments (Golonka et al. 2006; Cao et al. 2017). (g) Global palaeolatitudinal distribution of ice sheets from the palaeogeographic maps (Golonka et al. 2006; Cao et al. 2017). (h) Climate temperature gradients since the Early Devonian derived from Boucot, Chen & Scotese (2013).